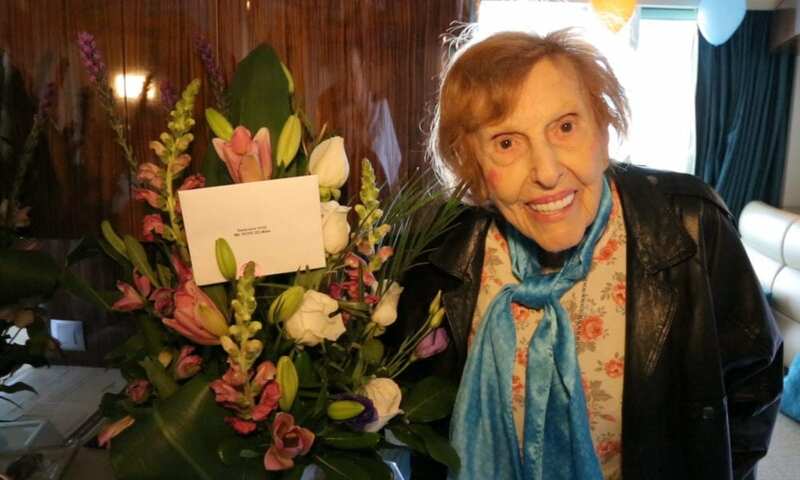 It was an epic event when this week, Norwegian Cruise Line helped Rose Zelman celebrate her 100th birthday. It was the 8th time Zelman has celebrated her birthday aboard a cruise ship, but this one was certainly a night she will never forget! Although Zelman has been traveling the world for most of her life, she actually didn’t take her first cruise until 2005! Before that, she had done most of her traveling by the side of her beloved husband, Bob, who passed away in 2001. Soon after that, she met and befriended Omar O’Besso… and it was he who would eventually introduce his new friend to the wonderful world of cruising. You see, O’Besso eventually took a job at Norwegian Cruise Line, where he works as an on-board concierge. And in 2005, he suggested that perhaps cruising might be something she’d enjoy. Hooked following her first voyage, Zelman began taking three cruises a year, always on ships on which O’Besso was working. Since then the native New Yorker has celebrated eight birthdays on board various Norwegian ships and enjoyed getting to see places as diverse as Alaska, Europe and the Mediterranean. For this very special birthday cruise, Zelman is enjoying back-to-back trips to the Caribbean on the Norwegian Epic out of Port Canaveral. The guest of honor certainly had a big night, which kicked off with a special dinner at Cirque Dreams Epicurean… at which she was joined by the captain and O’Besso, and after which she was brought onto the stage and presented with a special cake to mark the milestone! As balloons dropped from the stage, everyone in attendance — including the performers — joined in singing Happy Birthday to the birthday girl. We here at Cruise Radio want to add our birthday wishes to those extended by the folks at Norwegian. Her spirit of adventure and willingness to try new things — remember, she only discovered cruising relatively recently! — should serve as an inspiration to us all!